One of the main criteria used to define illegal mining is the absence of land rights, mining license, exploration or mineral transportation permit or of any document that could legitimate the on-going operations. Illegal mining can be operated o​n the surface or underground. In most countries, underground mineral resources belong to the state. Therefore, mineral resources can only be operated by a licensed operator according to the laws and regulations of the local government. Artisanal mining, in a strict sense, is not synonymous with illegal mining. Legal small-scale artisanal mining exists in many countries alongside large-scale mining. As defined by the Government of South Africa, "Artisanal mining means small-scale mining involving the extraction of minerals with the simplest of tools, on a subsistence level." However, most illegal mining is characterized by the small size of its operations. That's because large-scale illegal mining is very unusual and most likely linked to a non-authorized or non-documented extension of the granted land rights. Most illegal mining takes place in low-grade areas or abandoned mining sites. Low productivity and limited production are therefore the main attributes of illegal mining. However, there are exceptions. The size of a country and the frequency of the mining can turn micro-productions into a visible portion of a nation's overall production. For example, look at India. Coal specialists estimate that 70 to 80 million tons of coal are produced in India annually in addition to the official production figure of about 350 million tons. As reported by the Diamond Development Initiative, "more than a million African artisanal diamond diggers and their families live and work in absolute poverty, outside the formal economy, in countries struggling to recover from the ravages of war." There are consequently more people involved in the informal diamond exploitation than there are in the formal sector. 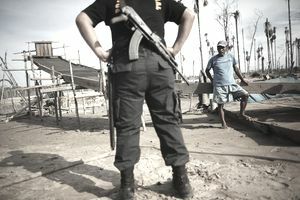 The United Nations (UN) defines blood diamonds (also called conflict diamonds) as "diamonds that originate from areas controlled by forces or factions opposed to legitimate and internationally recognized governments, and are used to fund military action in opposition to those governments, or in contravention of the decisions of the Security Council." By nature, all blood diamonds come from illegal mining activity because they are mined by forced labor and traded illegally. The sale of blood diamonds also supports drug trafficking and terrorism. The World Diamond Council estimates that conflict diamonds represented approximately 4% of 1999 world's diamond production. Today, this organization believes that more than 99% of diamonds are now conflict-free and traded under the UN-mandated Kimberley Process.